On Tuesday, September 18, the students from our after-school tutoring program took a break from homework to be wowed by our special guest speaker Rene Garcia Jr.
Rene Garcia Jr. is a local, San Francisco-based artist who explores the fields of painting, graphic designing, illustrating, and sculpting. 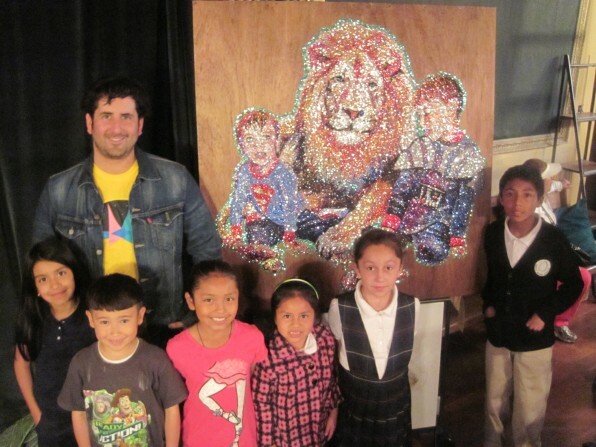 His most recent fame has been centered around his large, sculptural glitter paintings. He is known for reinterpreting popular art in a unique and dazzling way. The 826 writing lab was lucky enough to see one of these alluring, photorealistic pieces and the students were in awe of its sparkle. One of our students, Jessica Berrios, asked Rene about his inspirations and history as an artist. Rene spoke about his captivation with fantasy and the limitlessness of one’s imagination. Having entered the professional art world ten years ago, he stressed the importance of every student seeking out their inner artist and creativity. His and the students’ shared enthusiasm for chunky Kindergarten glitter led to a sparkly extravaganza in the writing lab with many of the students gluing and glittering their own works of art! This entry was posted in 826 News, Featured and tagged After-School Tutoring, Guest Artist Series.